Welcome to our gallery showcasing white granite countertops. White granite countertops are a wise investment for any home. Not only does it add a unique attractive feature to your kitchen, but it also offers functionality and durability that no other natural stone can surpass. 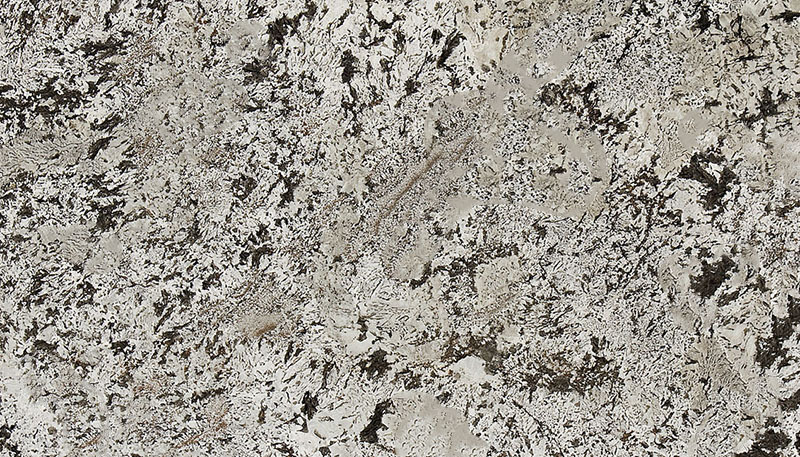 Find out what white granite colors you love the best for your future kitchen remodel. For more information visit this page to read our granite countertops ultimate guide. In general, granite is a popular choice for countertops because it is a strong material which can stand the wear and tear of everyday use. It is widely available in the market which makes material sourcing easy for any project. It is versatile and can be used in any design as it is available in a broad range of colors and patterns. Among other things, it is also, stain resistant, scratch resistant, heat resistant and and low maintenance. Timeless beauty. 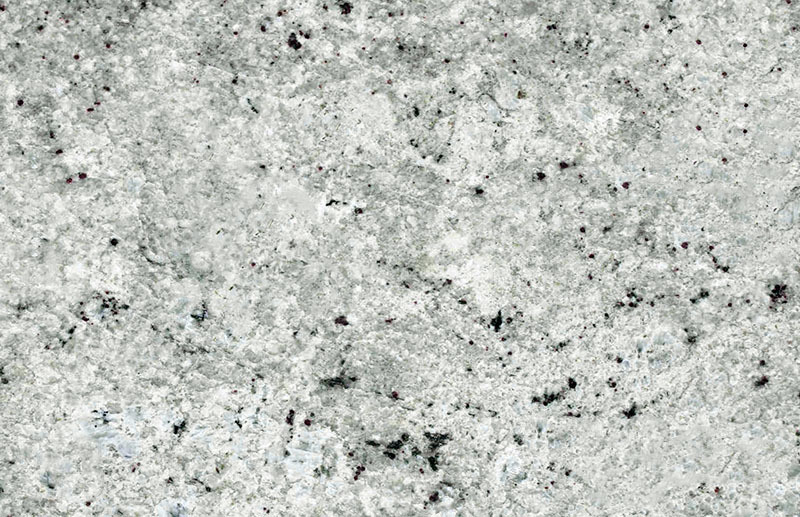 White granite is available in diverse types, patterns and colors, ranging from a snow white to a creamy ivory shade. The presence of flecks and veins arranged in different patterns give it a distinctive look. Whether it may be a striking contrast or a subtle variation, white granite adds character to your kitchen and makes a great focal point for your home. It has that classic timeless flair which instantly brightens any space, giving a crisp clean look to your home. It is luxurious, ultra stylish, sophisticated and will never go out of date. Creates a spacious environment. As a general rule in design, light colors tend to make any space appear bigger. Using it as a countertop creates an illusion of a spacious atmosphere which is open and airy. It is suited to be used in small kitchens as it instantly brightens the space. It also works well for big kitchens because it expands the look and is a good trick to liven up dark rooms. Versatile and flexible. One can never go wrong with white granite countertops as they match almost anything. It has great compatibility for any design style, cabinetry finish and wall color. If used with dark cabinets, they provide a stunning contrast. If paired with white cabinets, it breaks the monotony of the look. It even complements any shade of wood stain. Style wise, it is ideal for classic interiors and a top choice for modern homes. 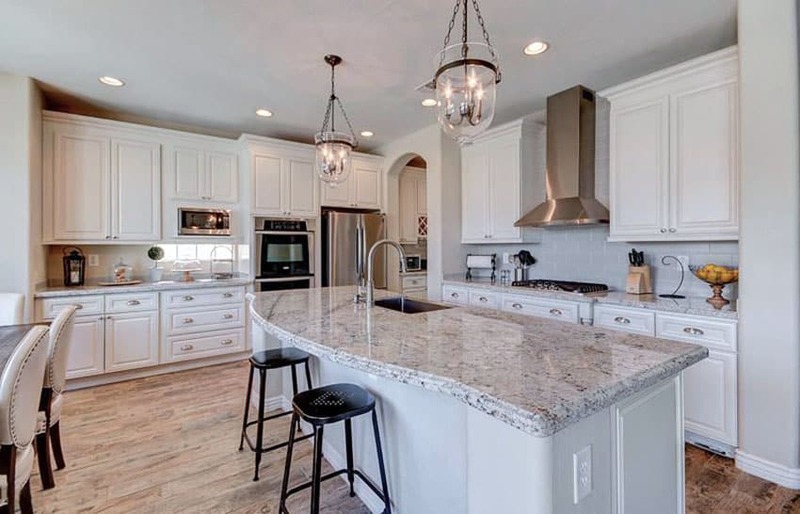 White is a flexible color, and since white granite has flecks which vary from beige, brown, gold and gray, these mixtures of colors make it highly suited for all interior color palettes. Aside from the advantages that white granite gives, also keep in mind that there are some “cons” to using this material. Some white granite contain iron which oxidizes or rust easily. Stains are also more visible on white surfaces rather than dark colored ones. Also remember that just like any other granite, it requires periodic sealing to prevent any spill and stains from seeping through your countertop. If you want to make your white granite countertop last a long time, preventive maintenance is the key. Here are the most popular types of granite, listed with country of origin, cost and other facts. 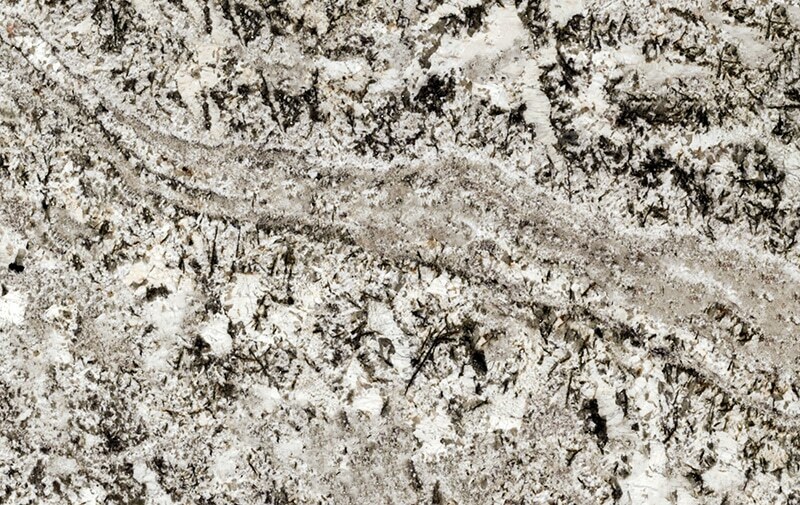 Characteristics : Kashmir White granite is the most popular variant of white granite. It has that “salt and pepper” look which is characterized by a mixture of flecks of white feldspar, gray ash quartz and dark mica. Sometimes it also has a tinge of dark red color which comes from garnet. 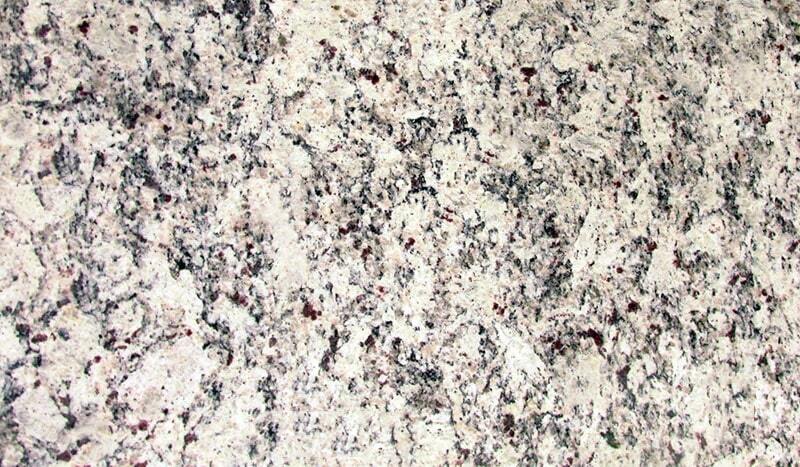 This type of granite is a very popular choice for modern contemporary kitchen. It is also versatile as it works well with any color of kitchen cabinets. 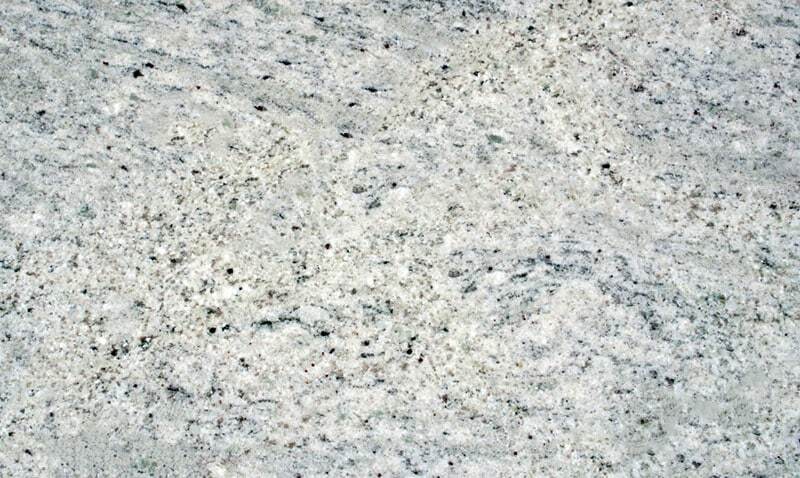 Characteristics : Bethel White granite is a medium grained type of granite which is characterized by a creamy off white background with light gray to black specks. It is also known as Hartwick White, Bethal White, Bathel White, White Bethal. 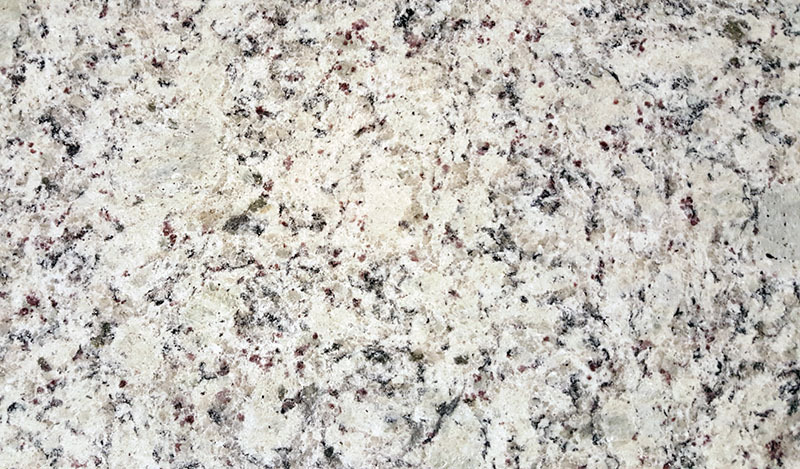 Characteristics : White Spring granite has the illusion of movement in its design because of the varying vein pattern of whites, grays and deep reds. pair this off with white cabinets to make a stunning design statement in your kitchen. Characteristics : Its dominant colors are a mixture of light grayish to brown with black heavy vein pattern. This type of white granite is ideal for adding depth to light colored interiors. 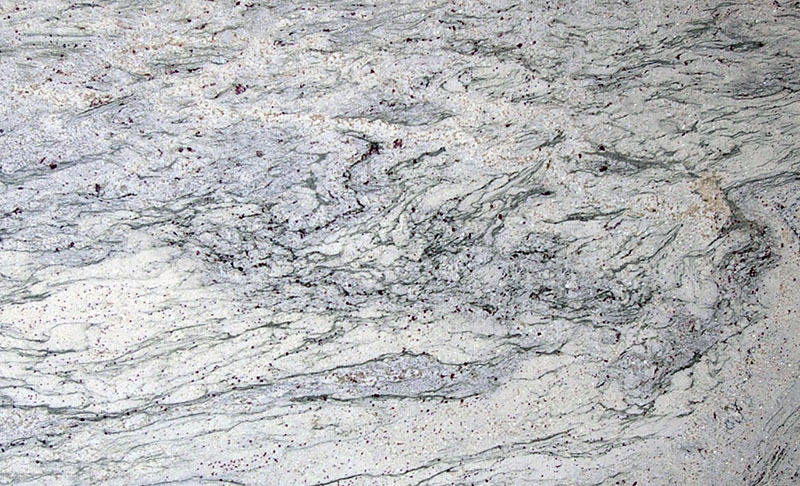 Characteristics : River White granite has a low variation when it comes to its veining pattern. The veins are usually light to dark gray with a streak of burgundy flecks. It is available in brushed, polished or honed finish. 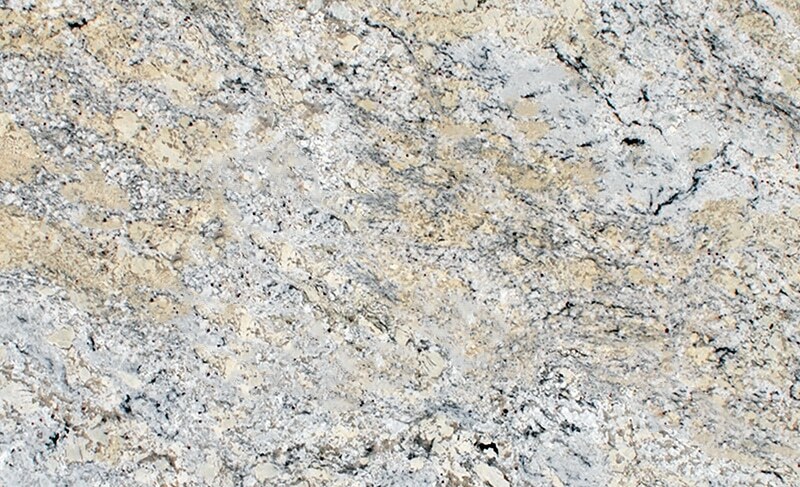 Characteristics : Ice Blue granite has a cream white to light bluish color which features a unique pattern of brown, gray and black veins. Its design is somewhat flaky in appearance which makes it unique from any other natural stone. It is ideal to be paired with light colored cabinets. 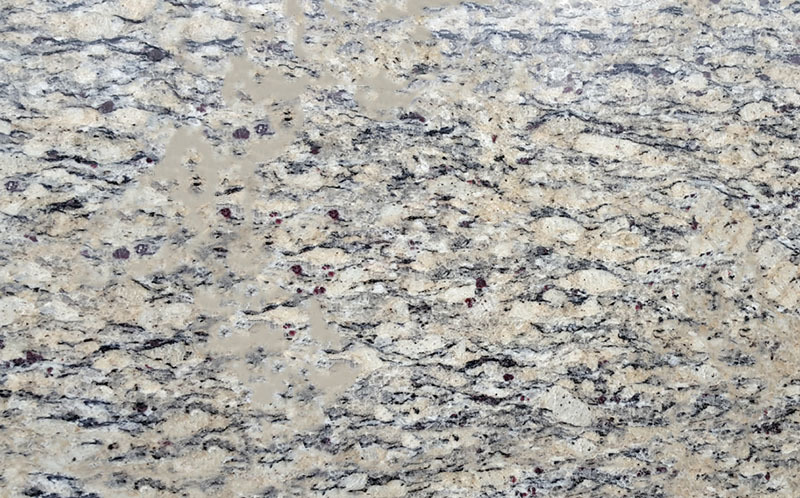 Characteristics : White Ice granite features a combination of gold streaks and dark brown, charcoal and black veins. This stunning contrast in color makes it suitable for a wide range of cabinetry finishes. 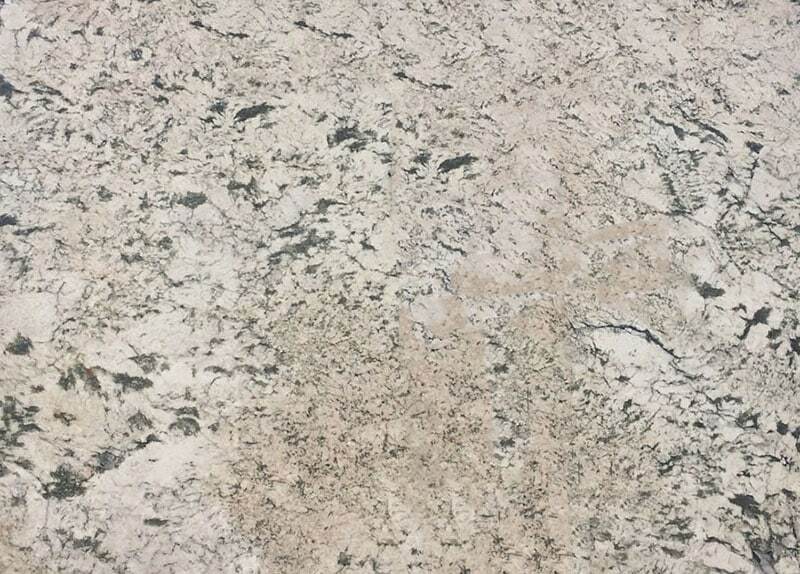 Characteristics : Dallas white granite has light grays and slight lavender tones mixed with golden cream & brown. Its veining pattern is large scale and is mixed with visible dark crystals. It is often used for kitchen countertops. 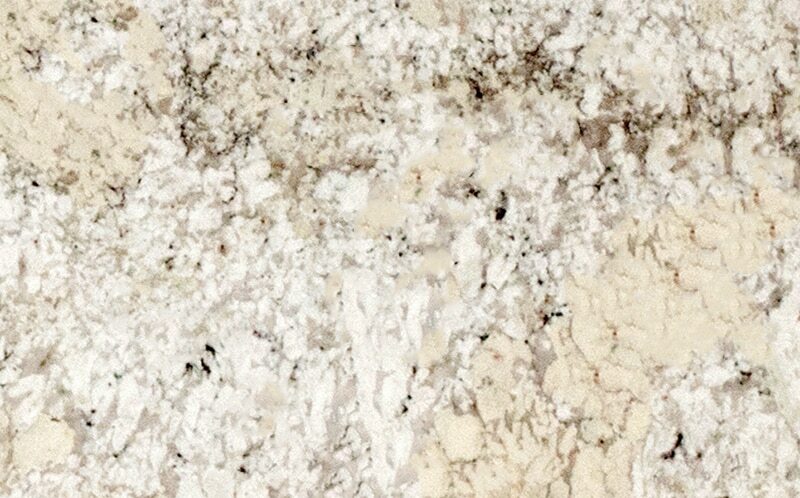 Characteristics : Ivory Cream granite is more beige to light brownish in color rather than white. It features a combination of gold, browns, grays and black flecks of minerals. This type of white granite is ideal for adding depth and warmth to a space. Visit this page for more beige granite countertop ideas. 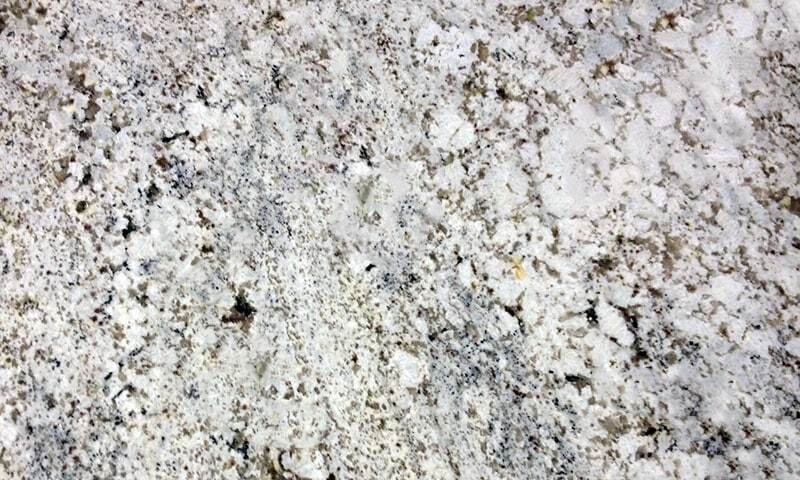 Characteristics : It is a fine grained white granite which has specks of bright ochre and black colored granules. Tones of gray are also dominant in this type of stone. 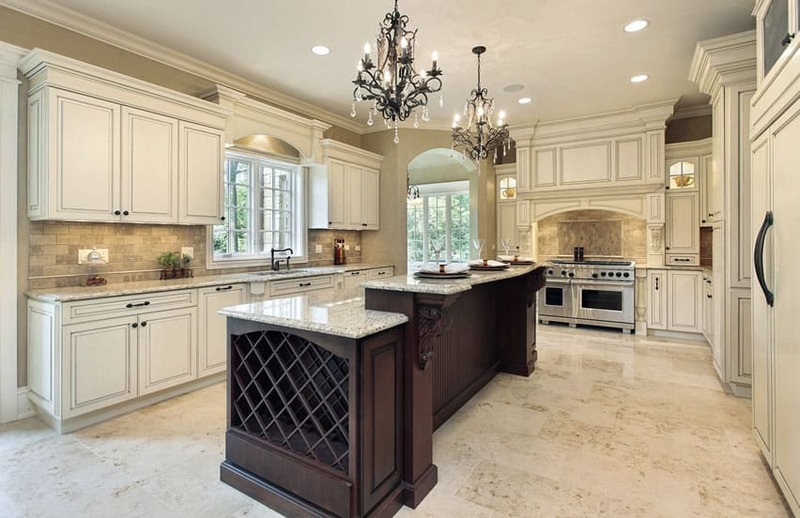 This type of white granite can be best paired with light wood, cream or white cabinets. 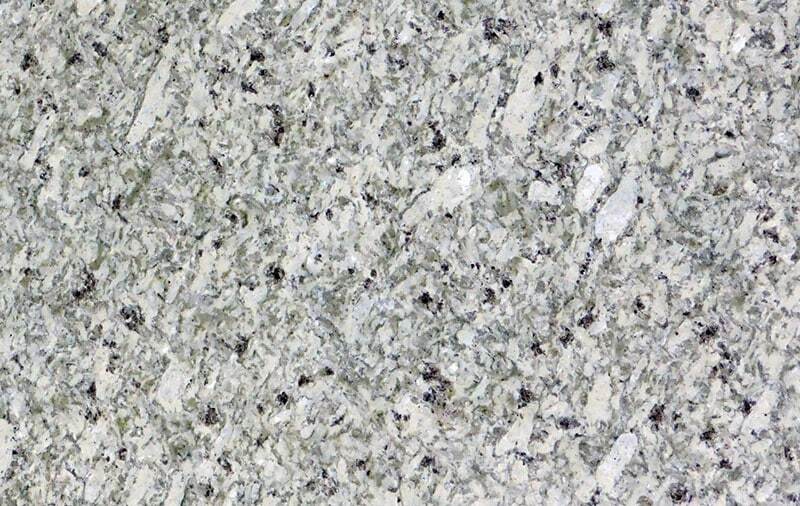 Characteristics : Moon White granite is a finely grained granite which has an elaborate pattern. 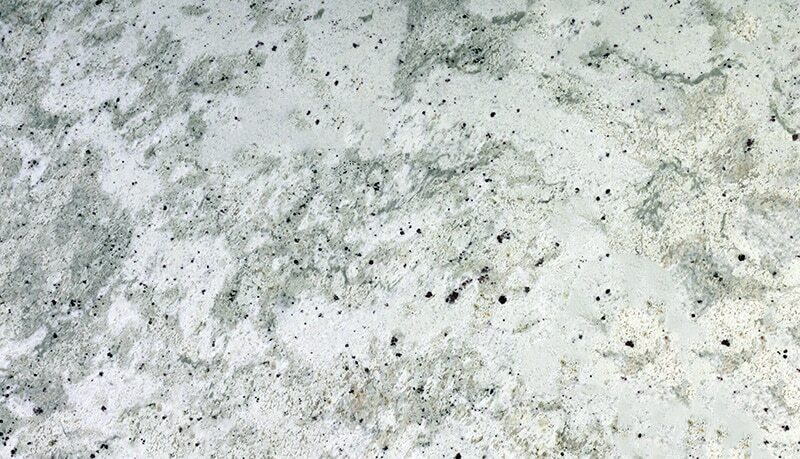 It has speckles and swirls of bright ivory mixed with silver, grey ,black and a hint of green hues. It is also known as Bacca Bianca, Emerald White ,Kashmir Pearl or Morning Mist. Characteristics : A gray and white marble which has a dramatic appearance of sweeping veins. It is also known as Moonlight or White Fantasy. It adds elegance to any kitchen when used as a countertop. 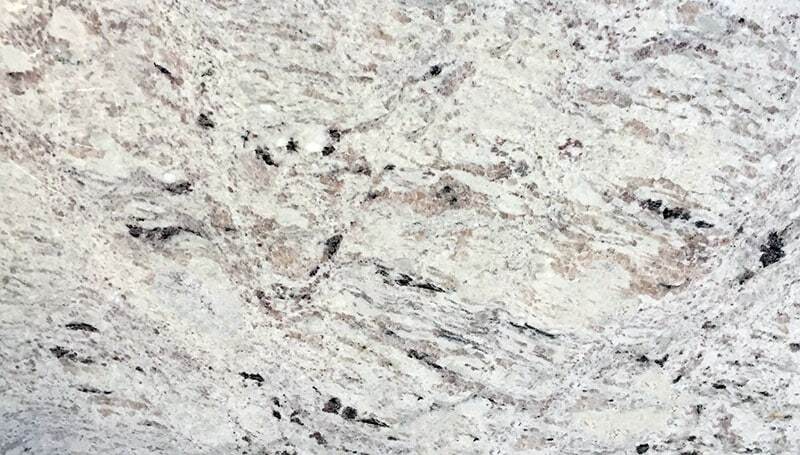 Characteristics : This white granite has a blend of pale silver and frosty whites, mixed with warm neutrals and onyx hues. It is a popular choice for homeowners because it adds a sparkle to any area. It is also called Alaskan White or Ice Brown. 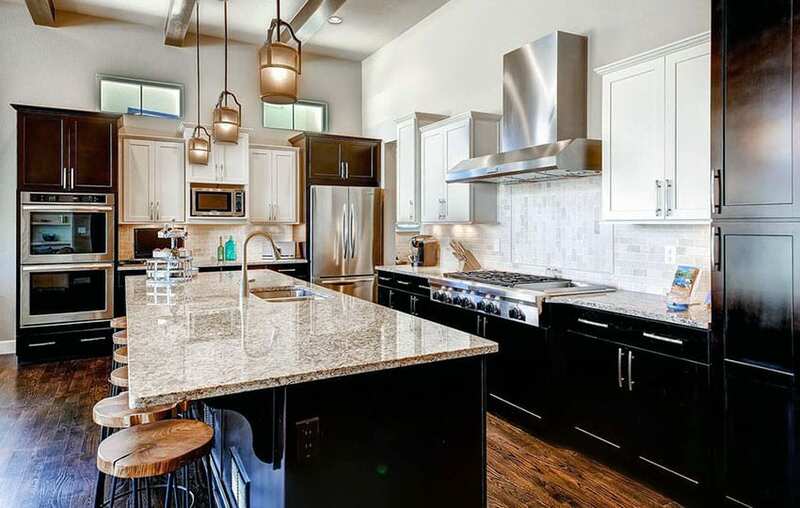 This type of granite makes an excellent focal point so make sure to pair it with white cabinets. 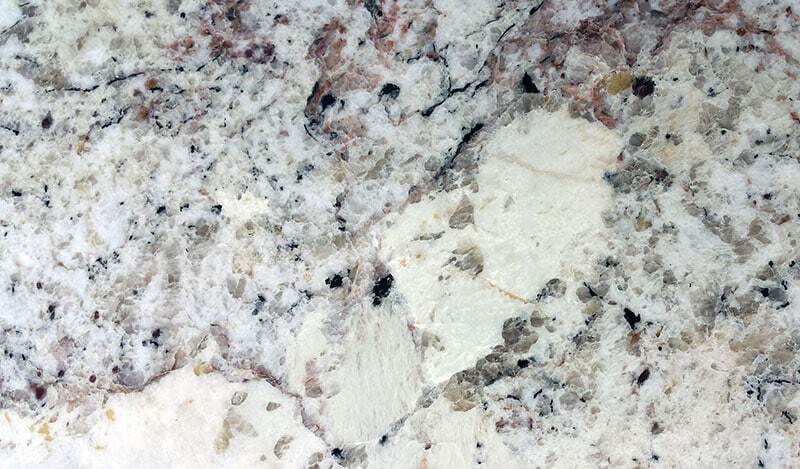 Characteristics : It is also known as Floratta White, White Latinum, Bianco Galaxy Granite or Galaxy Weiss Granite. A white granite with plenty of translucent quartz and black mica. Its rust tones also come from the presence of burgundy specks in the stone. This type of granite works best if you want to add a warm feel to your kitchen. 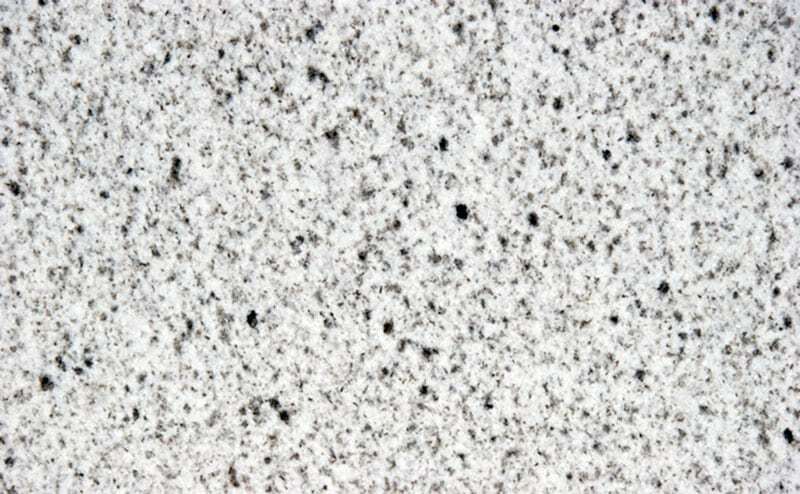 Characteristics : The base color for this type of granite is white and cool gray, blended with cloudy silver and accented by black speckles. It is also known as Cotton White, Balthus or White Antique. Characteristics : As the name suggests, its veining pattern resembles that of a tiger’s skin. It has a cream and brownish base color accentuated with brown and black striations. It is best paired with light colored cabinets so as not to overwhelm the space. See more black granite ideas here. Characteristics : It is a dramatic black and white granite with high variations of brown, black, and grey veining. Best used in polished finish for both interior and exterior applications. Also known as Branco Exodus. Characteristics : Its base color is white with gray silky textures and it is accentuated by black and gray veins. This type of granite resemble marble because of its veining pattern. Characteristics : It has a white background with light silver, gray and black veins. If examined closely, burgundy flecks are also present in this stone. Characteristics : Also known as Blanco Diamante.It has a cool white and gray background with frost like specks of dark gray, cream and black throughout. When paired with white or light colored cabinetry, it makes a stuning focal point for your kitchen. 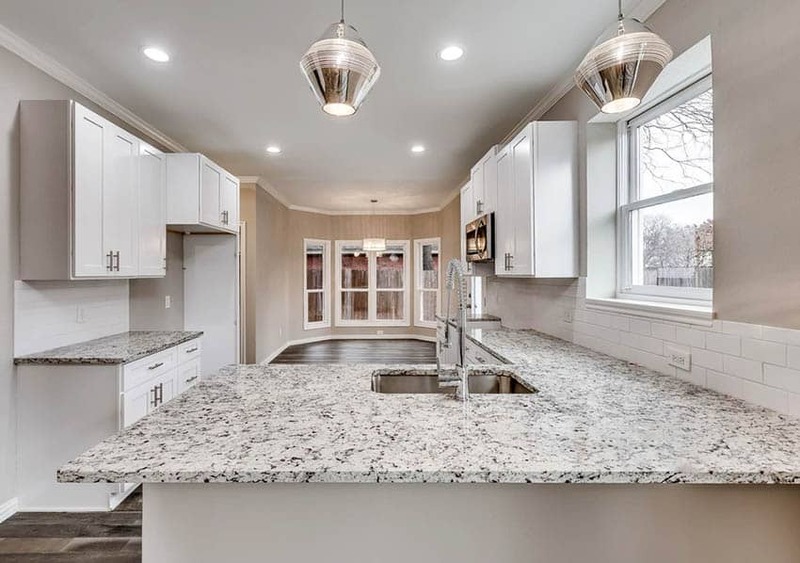 Characteristics : This type of white granite features cool white tones and grays highlighted by sparkling silver, onyx and frost white speckles. It is also known as Blanco Galia or Blanquino. Characteristics : Also known as Spectra White. Characterized by a cool white and gray base color complemented with warm gold veins. Its unique look make this natural stone ideal for a variety of design styles. Characteristics : It is a dramatic beige, light brown and white granite with high variations and veining. 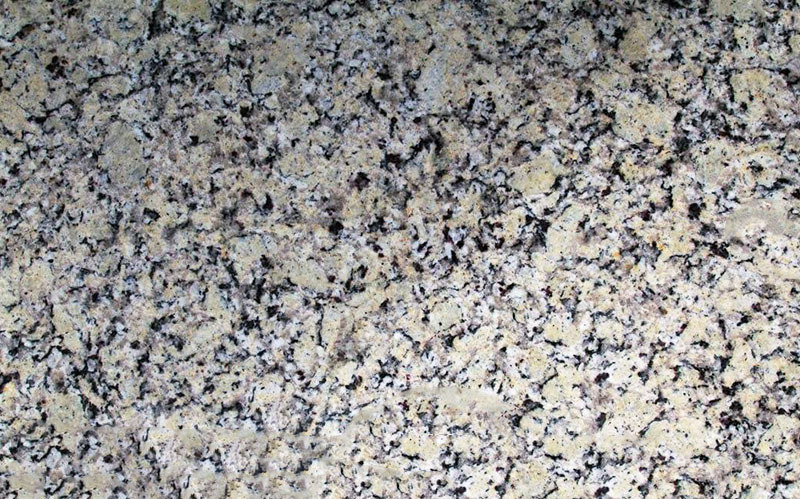 It is also known as Bianco Torroncino Granite. 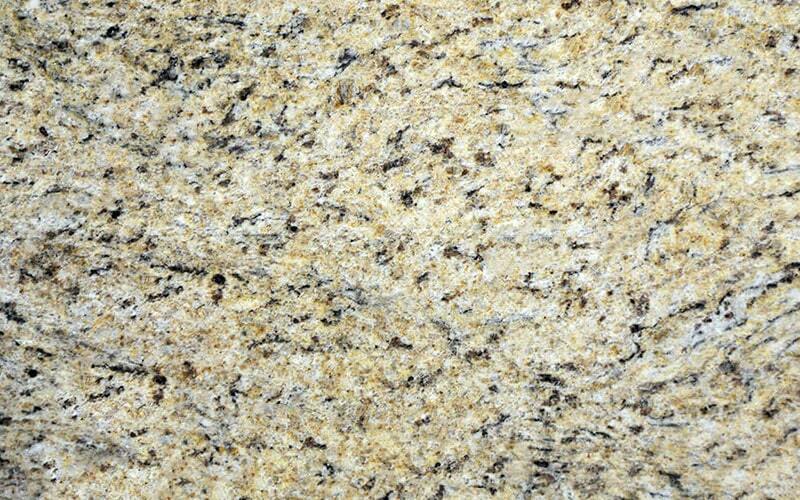 Characteristics : This type of granite is more gold than white due to millions of years of oxidation. However, if quarried deeper, this stone may appear more white. It features a beautiful beige background with burgundy, gold and dark gray veins. It is also known as Giallo Cecelia,Santa Cecilia,St. Cecilia Classic. When used for countertops, it adds depth and warmth to the over all look of your kitchen. This type of granite is ideal for Rustic and Country themed interiors. Characteristics : It has an overall creamy golden appearance despite its white and gray base color. It is filled with brown to black flecks of minerals which adds to its wrm glow. Also known as Branco Ornamental. 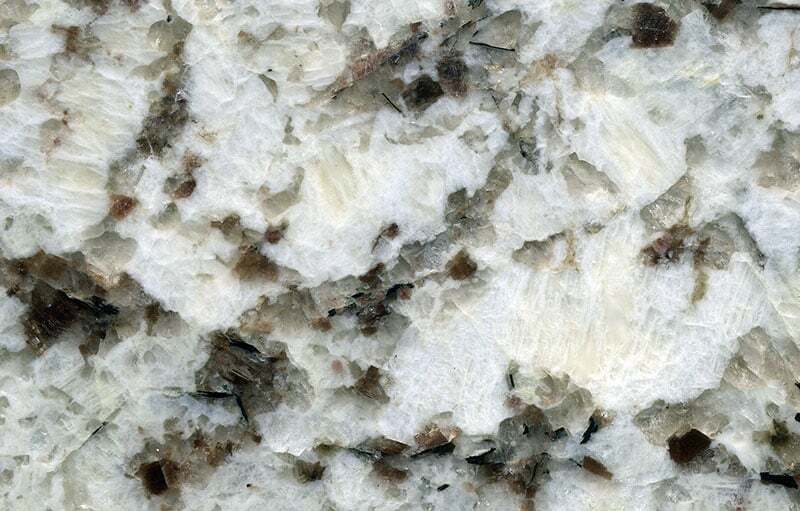 This type of white granite can be paired with a darker cabinet color for a soft contrast. The presence of dark minerals in its composition also complement dark cabinet colors. 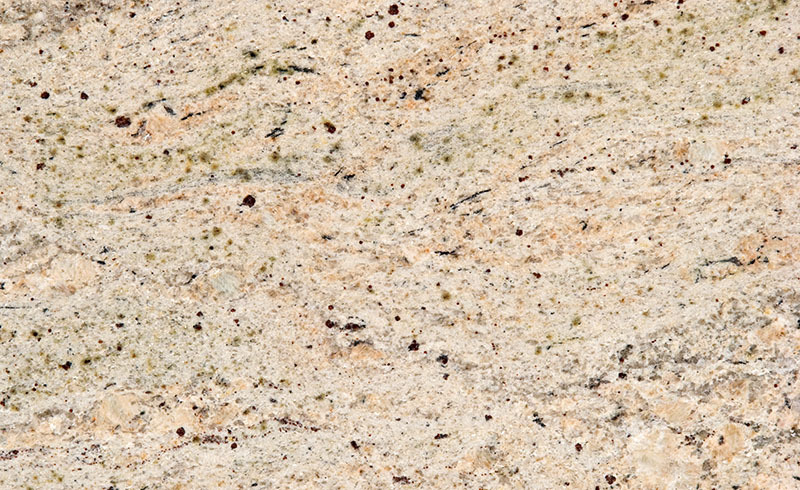 Characteristics : This type of granite has a white base color with a dramatic veining of grays and light bronze. Black specks of minerals also add character to this stone. Just like most white granite, it is very flexible in terms of design as it can be paired with any color of kitchen cabinetry. Characteristics :It is a type of stone that has a white bedrock color with large gray quartz deposits , brown mineral deposits, hints of burgundy garnet and black mica which are highly scattered around the stone’s surface. The overall look of the stone is slightly bronze and metallic. 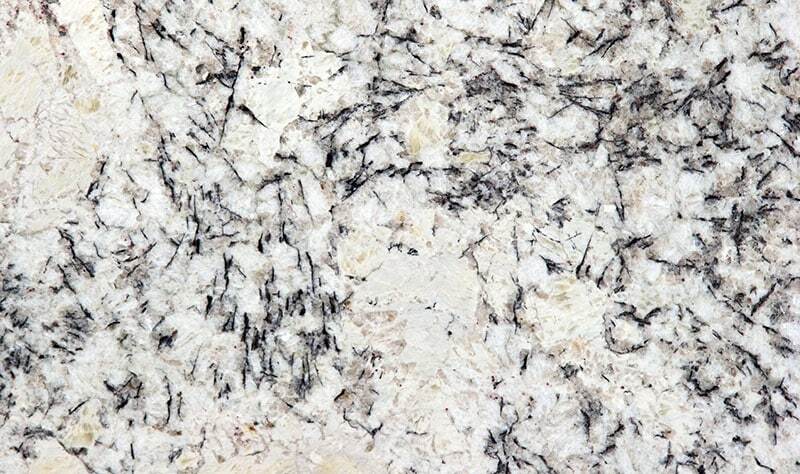 Characteristics : Also known s Alpine Star Granite, this white granite has medium specks of gray and black mica. This type of granite countertop is ideal for light to medium colored cabinetry. It also known as G439 Granite. Characteristics : It features highlights of gold and brown flecks against a soft creamy white background. This type of white granite complement the colors of wooden cabinetry. 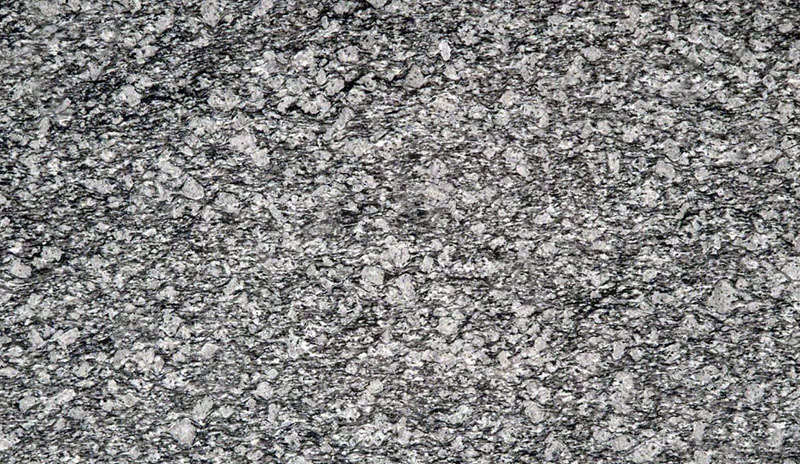 Characteristics : It has a white bedrock color which is filled with light gray and black flecks of stone. 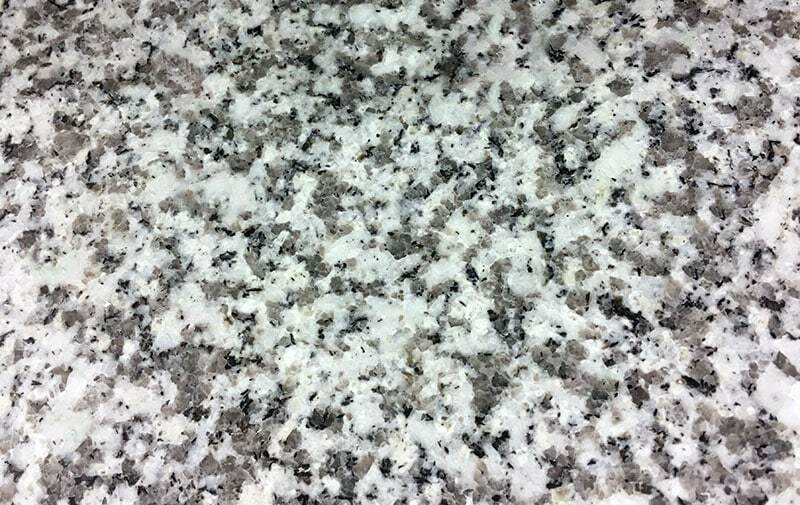 This color of granite is versatile and can be used to match light, medium to dark colored cabinetry. Characteristics : It is a finely-grained granite, imported from China, which features highly contrasted onyx and alabaster dappling. Gray tones are its dominant color and it is suited for creating contrast to white or light kitchen cabinetry. 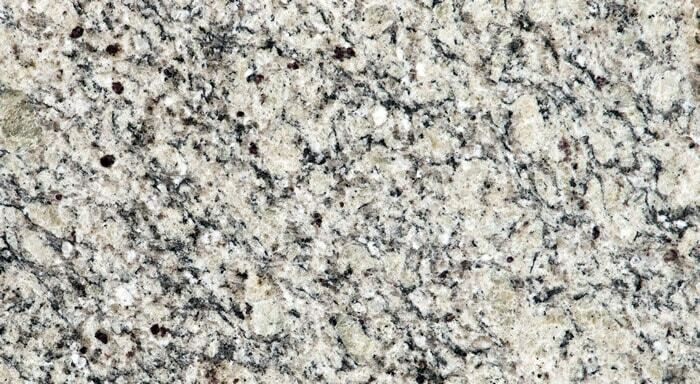 Other names for this type of granite are Spray white,Surf White,Water Wave and White Wave. Characteristics : It is a stunning white and gray granite with accents of beiges and charcoals. 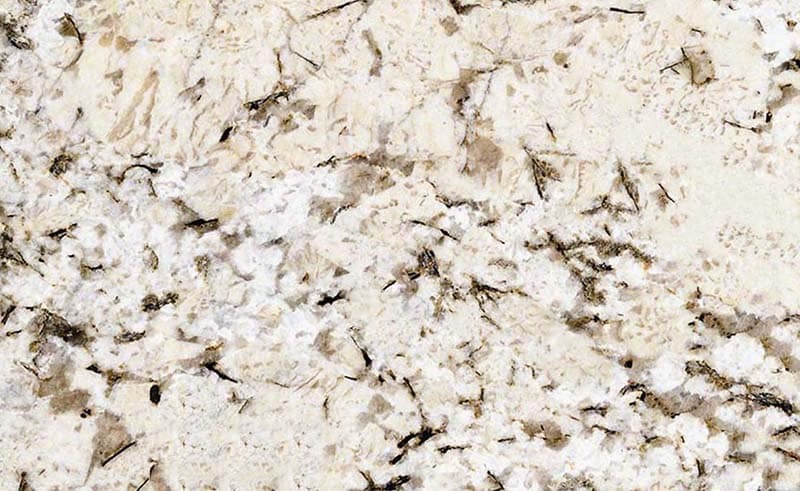 It is also known as Blanco Gabrielle or Snow Flakes Granite. Best paired with white cabinetry for that striking contrast in the kitchen. 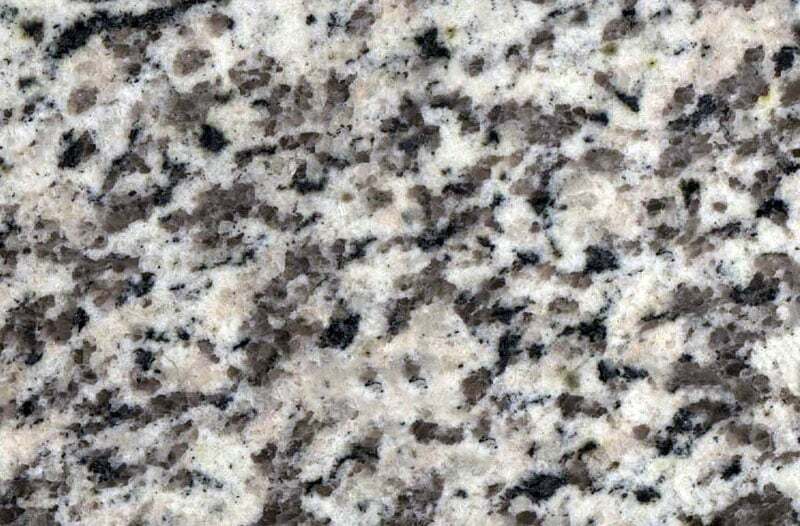 Characteristics : It is a white to cream colored granite with a subtle hint of light gray and light brown veins which gives it depth. 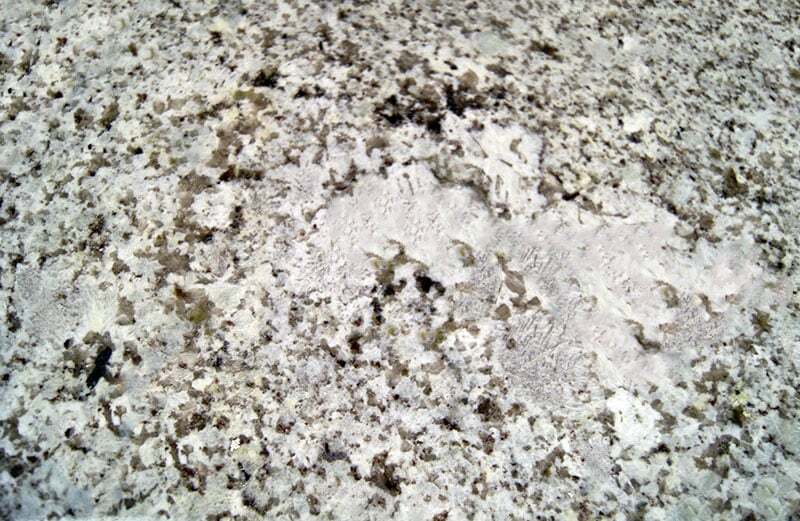 Characteristics : This type of white granite works well with white cabinet. It has a light brown and white base which is covered by dark veins and flecks of burgundy. It is a perfect pair for light to medium wood finish cabinetry. Characteristics : The creamy white background is complimented by the subtle cool cloud grey veins and mahogany tinted onyx speckles. Andromeda White is perfect choice for adding elegance to any space. Characteristics : Also known as Branco Piracema and Piracema Grey Stone Granite. Its general color is a mixture of cool to medium gray white and fine black flecks. 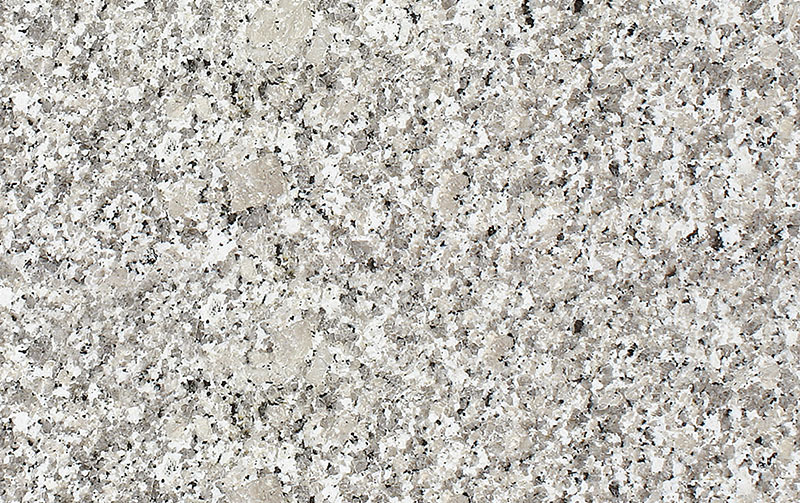 Characteristics : Also known as Venetian Ice Granite and Branco Venetian, this type of granite has a striking yet delicate pattern. It is a stone that is characterized by its beautiful golden color . Its light gray and black veins are mixed in stark contrast with its cream to yellowish base which makes it suited for both light and dark cabinets. Characteristics : Glacier white granite is characterized by a white background colored filled with fine black specks and few cool gray veins. It is a popular choice for modern kitchens because of its simplicity. Characteristics : Some of its common industry names are Barry White,Baso White,Bianco Amoy,Bianco Cordo,Bianco Crystal,Bianco Gamma, Bianco Gordo, to name a few. As mentioned earlier, white granite is a versatile material which goes with almost anything. It offers endless possibilities in terms of design and can be applied to match any theme in your home. It is mostly used for classic styles because of the timeless beauty it evokes, but it can also achieve a modern vibe. Just remember to pair it with the right kind of cabinetry to achieve the look you envision. To achieve a classic style, choose white granite which has veining patterns that closely resemble that of a marble. For rustic themed kitchens, opt for white granite which has a warmer tone to it so look for something which has brown and red flecks. On the other hand, the modern style is more streamlined and clean. To achieve this look, combine a simple cabinetry design with white granite that has low pattern variation and less vein striations. 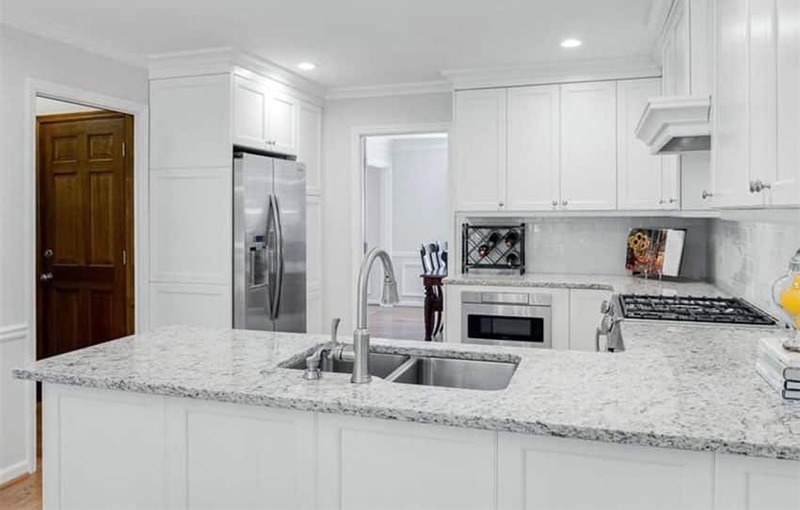 In choosing which type of white granite goes with white cabinets, there are actually no limits because white is a “fail proof “color. No granite is purely one color so it is hard to find white granite that is entirely plain. The presence of the mixture of colors in its surface make it an easy material to work. How do you know which one works best? It actually depends on the style or look you want to achieve. Coordinate not only the cabinetry and countertop color but also take into consideration all aspects and features of your kitchen. Know the existing style of your home and determine if you want to stick with it. 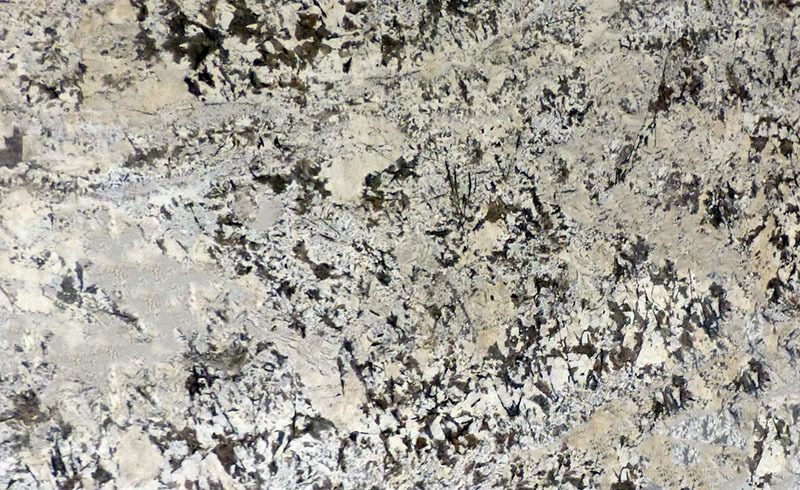 White granite can offer contrast to white cabinets because of its unique patterns. If you want to achieve a clean look, opt for white granite which has low pattern variation. 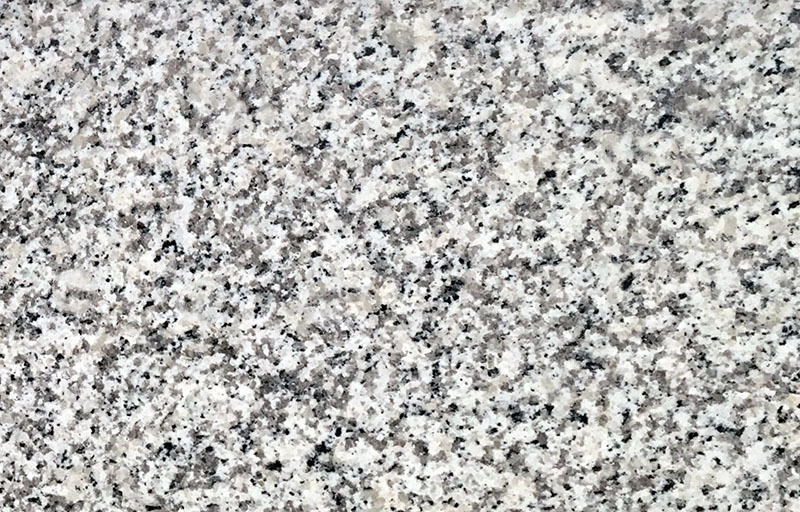 White Ice Granite, White River Granite and Kashmir Granite for example, are a great choice for kitchen countertop color to pair with white cabinets. If you want to add warmth to the overall feel of your home, pair white cabinets with a lighter version of the Santa Cecilia Granite. 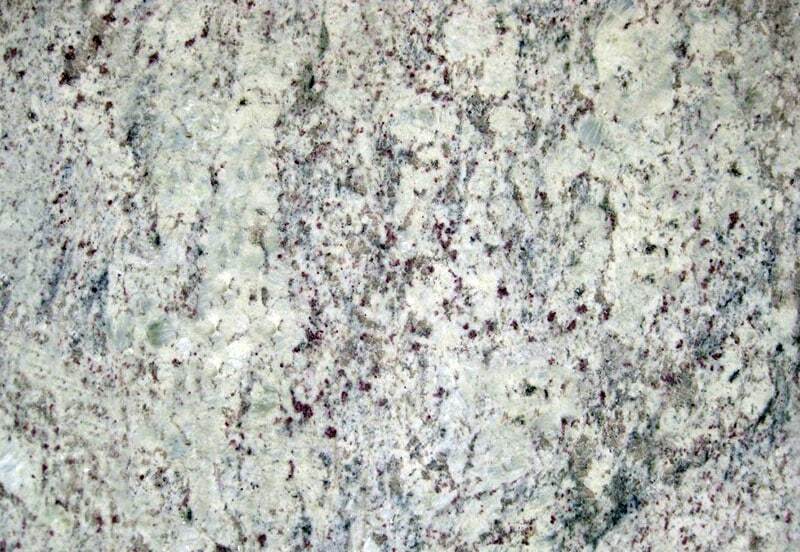 See more types of granite colors to choose from here. From the picture above you can see that the black specks and veins in the White Alpha granite gives it the needed contrast to be paired with white cabinets, without the kitchen design looking too white overall. To easily add life to a monotonous “white cabinet-white countertop” kitchen style, choose granite with high pattern variation and strong dark veins. The contrast makes the counter top stand out leaving a stunning focal point for your kitchen. Alpine White, Delicatus White and Winter White are some examples of white granite which can help achieve this look. To avoid giving your kitchen a dark and gloomy atmosphere, make sure to pair dark cabinetry with white granite that has a light to medium base color. 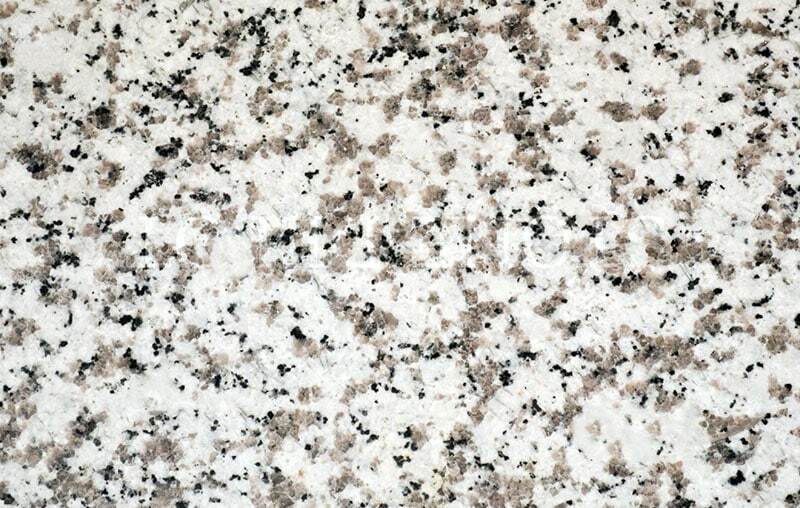 The classic “salt and pepper” granite is ideal in creating high contrast to black and gray kitchens. Break the heaviness of the area and do not overwhelm the space with intricately patterned white granite. Aspen White , Andromeda White, Moon White and Bianco Romano are some of the options you can try. 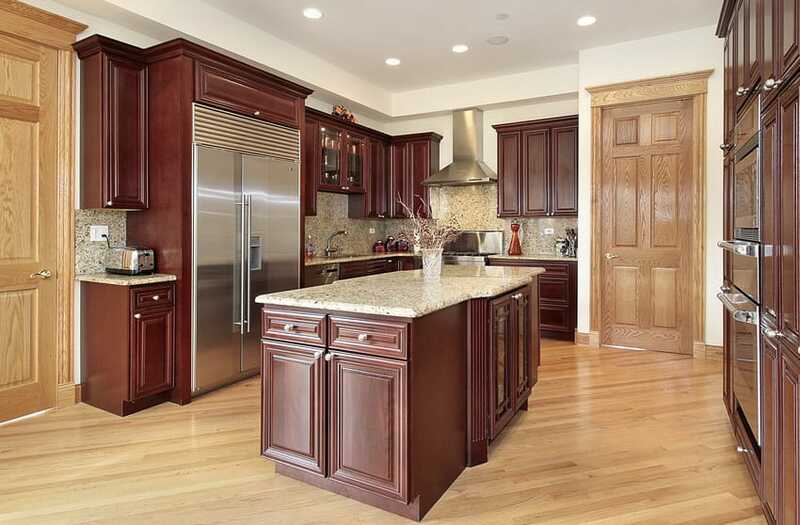 Cherry is a reddish dark colored wood finish commonly used for kitchen cabinetry. Cream colored to light brownish white granite complement for this type of kitchen cabinetry. When paired together, it creates a spaces which evokes warmth and coziness. It is commonly used in country or rustic themed kitchens. Pair it with light colored tiles for the flooring and you’ll surely make the room more inviting. 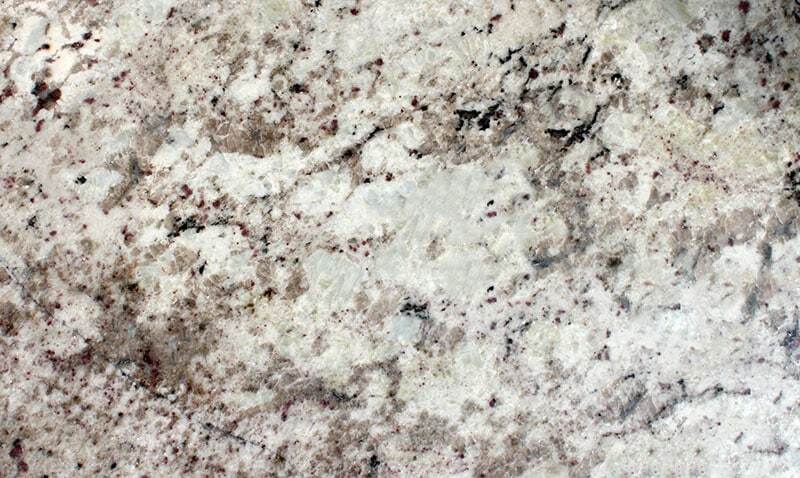 Some ideal white granite options for cherry cabinets are White Sand Granite, Antico Cream and Alps White. Mosaic tiles are an aesthetically pleasing and functional backsplash material which can be paired with white granite countertops. 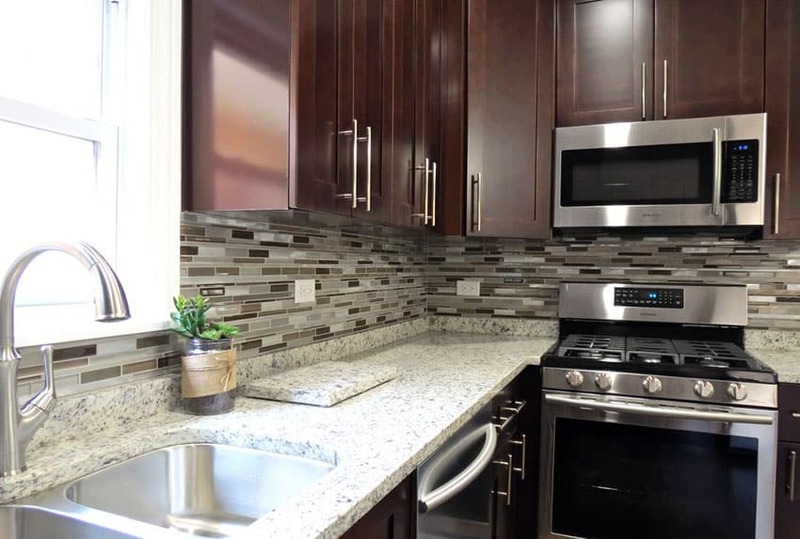 In choosing the right backsplash material color to match with your countertop, carefully examine the dominant base color and accent colors found in the pattern of the white granite then coordinate this together. An important style guideline to keep in mind is to never over design. Avoid pairing heavily patterned white granite with colorful mosaic tiles as it tends to overwhelm the look of the space. For more design ideas check out our gallery of the types of countertops here. White granite and white marble have an uncanny resemblance but the difference actually lies within their structural components. The minerals present in their composition make each of their properties different but visually they can look confusingly the same. Since granite is one of the hardest surfaces on earth, it is far more strong than marble. Quartz and feldspar give granite its durability, while the presence of significant quantities of softer mineral components such as calcite make marble less impervious. A downside of using marble is that it easily reacts to acids. When it comes in contact with food which are acidic in nature, dull spots are left on its surface which make it a displeasing eye sore. Granite is also superior to marble when it comes to longevity and requires less effort to maintain. Cost wise, granite tends to be a better investment for your home since it will last longer. 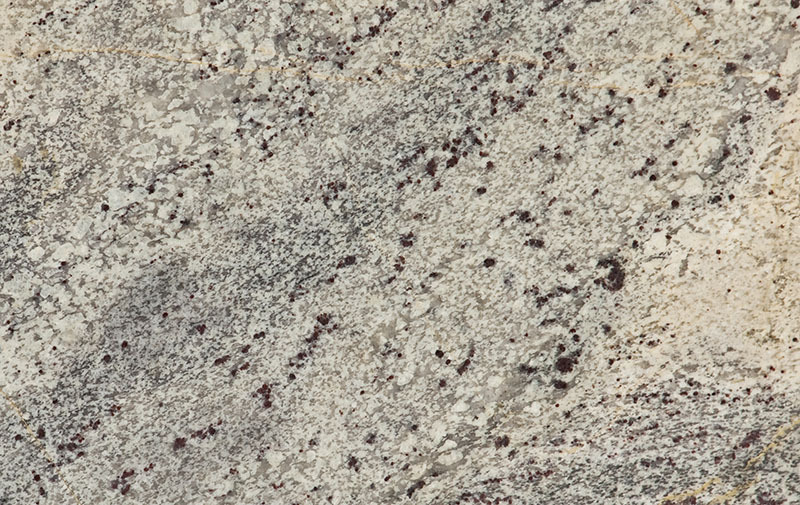 Granite is a more favorable option than marble, although several factors can affect its pricing. Visually, white granite and white marble both add a timeless flair to any space since they both give off class and elegance. In general, granite is an ideal alternative to marble. White Carrara Marble, for example, is one of the building materials which can be substituted with granite. Carrara marble is a high quality type of white marble which has a bluish gray color and has a distinctive look of white and gray veining. It is the most famous type of marble as it has been used in well known classic sculptures and notable buildings such as the Pantheon and Michelangelo’s David. It is commonly used in construction for both interior and exterior finishes, with kitchen countertops being one of its applications. 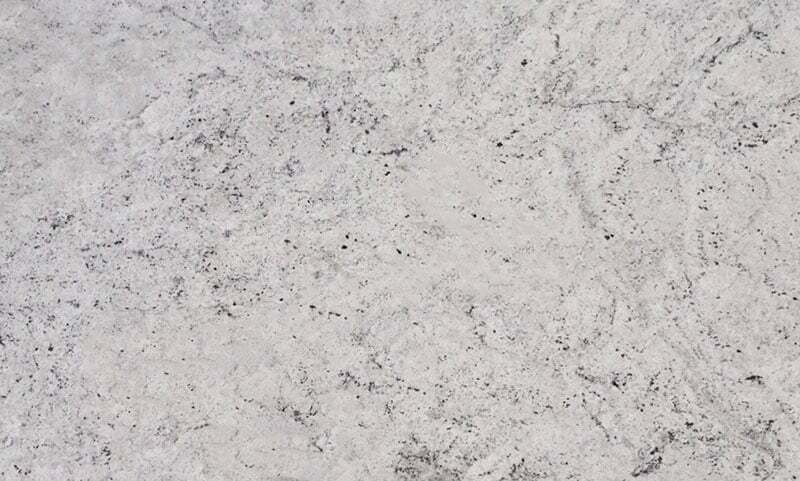 Bianco Romano Granite – It is the top contender for an excellent substitute to White Carrara Marble because they completely look alike. When placed side to side with the Carrara, it is almost hard to distinguish their difference. 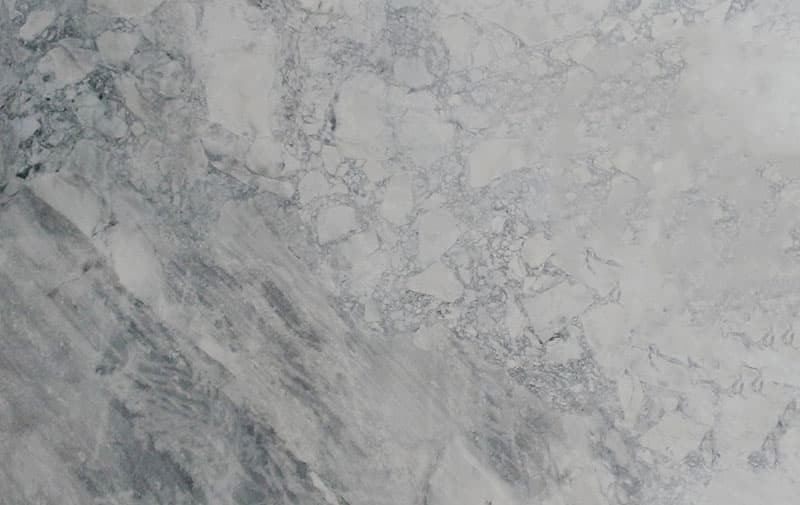 It also has that stunning gray and white veining pattern which closely resembles the Carrara. 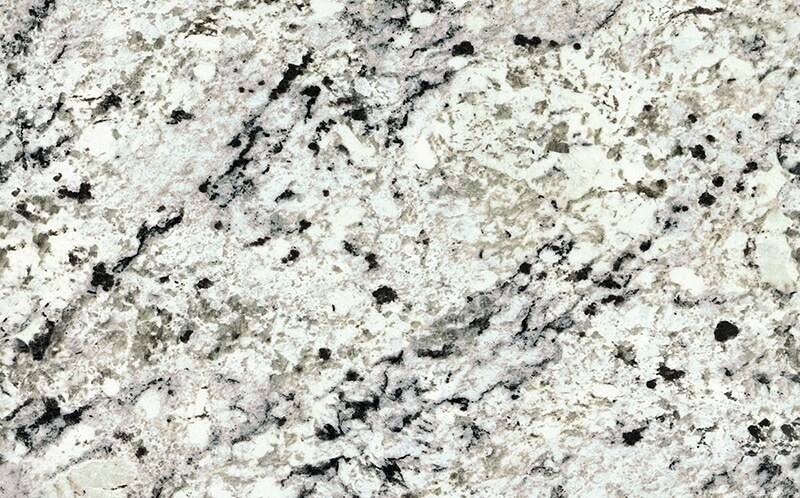 The appearance of Bianco Romano Granite matches that of the Carrara Dark (lots of veining) and the Carrara Medium (less veining). Beola Ghiandonata Granite – This type looks more like marble than granite and has the same gray linear striation pattern of the White Carrara. It is more grayish than white, so some may not consider this if you want that ultra white look. 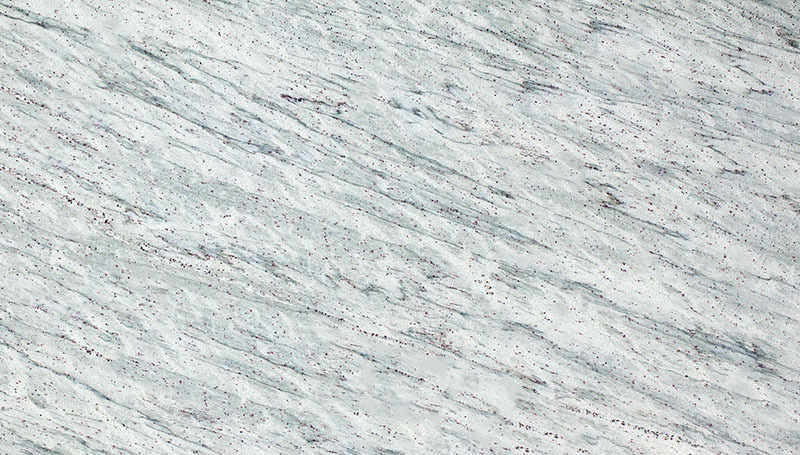 Glacier White Granite – It has a grayish to white base color filled with striations similar to marble veins. The darker gray variant comes with a more mottled “granite” pattern. 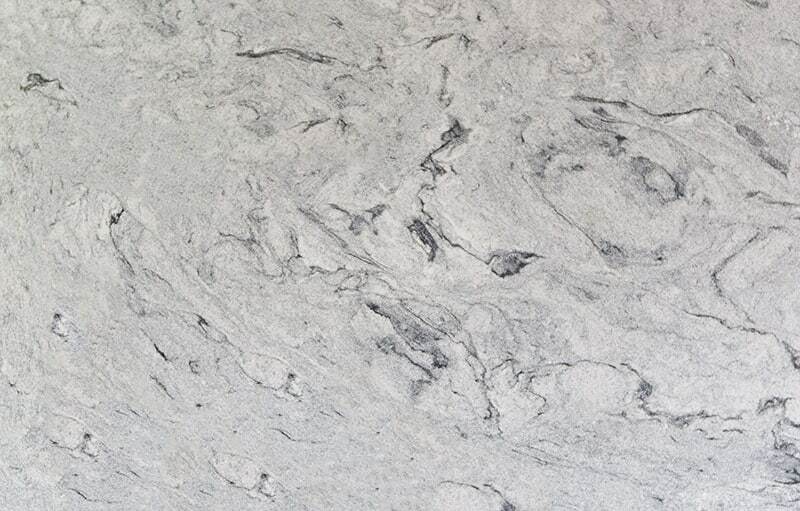 Casa Blanca Granite – Its veining effect closely mirrors that of a marble but has a more grayish base than Carrara. Visit this page to see our gallery of granite countertops for more finishes, edge types and colors.